Midlina (Iceland), February 2010. 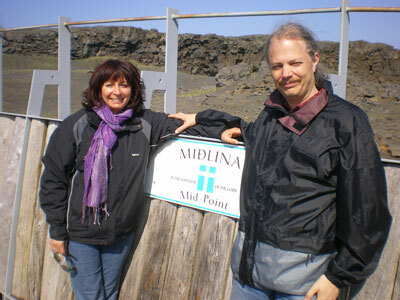 Deborah and Don on the bridge between two continents (the North American and European tectonic plates meet here). We’re from Vancouver, Canada, and we love to travel. We have taken many short trips over the past ten years or so, finding ourselves in places like Chile (Santiago and Valparaiso), Mexico, Cuba, Belize, Morocco (Marrakesh and Casablanca), Ghana, Iceland, Denmark (Copenhagen and Nyborg), Berlin, Paris, Amsterdam, Cairo (just as the protests took hold), and closer to home, all over the western parts of Canada and the US. Travel time, however, would usually range from one to three weeks – never enough time to do more than catch highlights, and before you know it, you’re home and back to work! So the opportunity for the two of us to plan to leave everything behind for a full year, and explore a big chunk of territory was something we jumped at. We decided to focus on Central and South America for a number of reasons. We knew the costs would be much less than for a year in Europe, we liked the parts of Central and South America we had visited in the past, and the opportunity to learn Spanish along the way (except in Brazil) was an added attraction. We’re also drawn to warmer/drier climates, pre-Colombian ruins, and the beach; especially the beach. On December 31 we let go of our apartment after putting everything into storage, said goodbye to family and friends and embarked on what we hope will be a great adventure. We like to think of this blog as a series of digital postcards – with guaranteed delivery (even from European cities, many mailed postcards never made it to family in Canada). So please enjoy, and let us know what you think! When not on the road, Don is a regional coordinator with Amnesty International Canada, and Deborah is the former director of operations at the Bill Reid Gallery of Northwest Coast Art. An ice rink in MEXICO CITY in January……………….WOW……………Looking forward to an update on your travels!!!! We wish you a very happy and exciting New Year, may your travels continue and the fuel for stories never run empty. Great account on our Amazon River Boat expedition! Just found your Whirl Famous—remember Pogo?—Traveller log from your message on Linkedin. Would love to do this level of adventure abroad but naayyy! However, I found Road Scholar and looking fwd to a bit more and perhaps more interesting trooping. Have fun wherever you are in the world today and safe journey. Hey .. where are you guys now??? Still traveling?